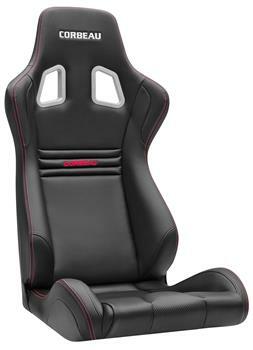 The Sportline Evolution X is the newest addition to our Sportline series of seats. The Evolution X was inspired by the C5 and C6 Corvette. As most Corvette owners know, seating options are limited due to the small cockpit area of the vehicle. Because of its unique design, we thought our Evolution seat, which is the reclining version of the Evolution X, would be a perfect seat for the C5 and C6 but unfortunately it was just a little too wide down by the reclining mechanism. The seat looked so good that we had to figure something out. That’s when we decided to eliminate the reclining mechanism making the seat just narrow enough to fit in the Corvette. When you sit in the Evolution X, you’ll notice how the strategically placed bolsters hold you in just the right places. We made the angle of the back at what we feel is the most comfortable angle for a daily driver or where most people would recline their seat. Whether you drive on the street, the track, or offroad, you’ll notice how the Evolution X virtually eliminates body shifting, meaning your body won’t get fatigued. Adding to this, the Evolution X features our injection molded foam, known as one of the most durable and comfortable foams available. This foam will hold it shape for years to come ensuring your comfort for the life of your seat. Each Evolution X seat is hand crafted with our red offset stitching giving the seat and your interior an added look of luxury. The Sportline Evolution X is available in black vinyl with a carbon fiber vinyl contrast. The Evolution X has a seat base height of only 2.5 inches. That means is if you sit the seat on the floor the distance between the floor and where you would sit is 2.5 inches. Comparatively speaking this is a thin seat base, which is ideal for minimal headroom applications or for drivers wearing helmets. Please note that because of the design of the Evolution X, a 5th slot (anti-submarine) cannot be added to this seat. As a rule of thumb, the Evolution X will fit up to a 38-inch waist.